Paris, Galerie Claude Bernard, Balthus: dessins et aquarelles, October 1971, no. 18 (illustrated). 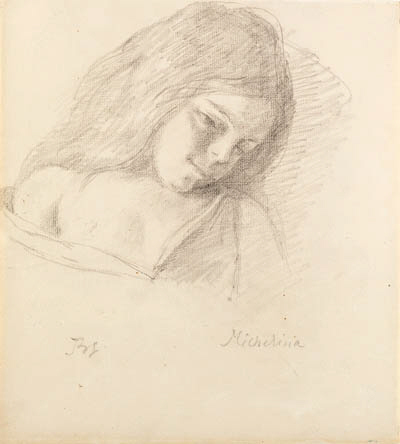 Virginie Monnier will include this drawing in the forthcoming Balthus catalogue raisonn to be published by Editions Gallimard, Paris. In 1961 the French Ministry of Culture approached Balthus to become director of the French Academy in Rome, and the artist took up residence at the seat of the academy in the Villa Medici. Around 1968 Balthus engaged as models Michelina and Katia, the adolescent daughters of a clerk at the Villa Medici. They feature in a group of paintings executed over a period of nearly ten years and completed before Balthus left Rome in 1977. Michelina is the subject of Nu au repos, 1977.